Feeling out of shape and fat? Here’s how to fix that: Start walking. Mon., June 12, 2017, 6 p.m.
Diana Nyad – the endurance athlete who, at age 64, swam from Cuba to Florida – has another big dream. It doesn’t involve water, poisonous jellyfish or an exhausting 111-mile journey that took her 53 hours. Instead, it involves millions of feet, which Nyad wants to see stride across every state in America. “Sitting has become the new smoking,” she often says, quoting James A. Levine, a Mayo Clinic physician, whose now-popular phrase speaks to the way our culture’s sedentary lifestyle is ruining our health. More than 70 percent of adults are overweight or obese, according to the Centers for Disease Control and Prevention. For both men and women, heart disease is the leading cause of death. Half of U.S. adults have diabetes or pre-diabetes, a 2015 JAMA study reported. 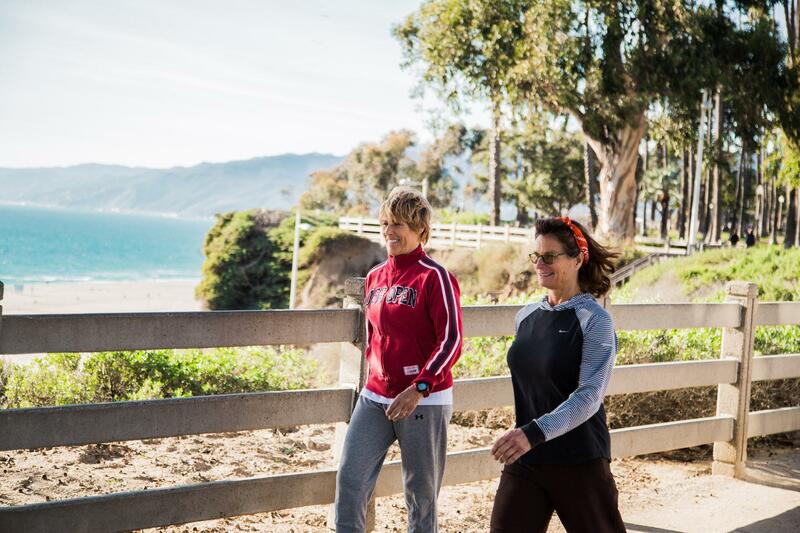 In 2016, Nyad and her best friend, Bonnie Stoll, a former professional racquetball player and the leader of Nyad’s Cuba expedition, launched EverWalk, an initiative that aims to get Americans on their feet. Anybody can commit to walking at least three times a week by signing a pledge on EverWalk’s website (at everwalk.com), where Nyad and Stoll recently posted a training schedule and opened registration for their next big event: EverWalk New England, a seven-day, 150-mile trek from Boston to Portland, Maine, that starts Sept. 10. “It’s a stunning, idyllic New England showcase of a route, almost all of it along the ocean’s edge,” said Nyad, who recently gathered more than 600 EverWalkers to team up with the nonprofit River LA for a 6.5-mile morning walk to celebrate the development of a 51-mile no-car path along the Los Angeles River. Unlike swimming, cycling or running, which require special equipment and can be hard on the body, walking is the perfect way to get fit and improve your well-being, Nyad, 67, said. It’s a low-impact activity that almost anyone can do: young, old, fat, thin, rich or poor. More than 3,000 people have taken the EverWalk pledge so far. Eventually Nyad and Stoll envision tens of thousands, hundreds of thousands, even a million people joining them virtually for regular walks, no matter where people live. They are working on a website they hope will become “the word in all things walking,” where people can find walking partners, vacation walking routes, training tips and incentives. EverWalk’s inaugural event in October was a seven-day, 133-mile trek from Los Angeles to San Diego. About 300 people participated as day-trippers, virtual walkers (who walked in their own home town) or epic walkers (who covered the whole distance). One of the epic walkers was Laura Petersen, 49, a statistician at UCLA. Petersen has never been the athletic type, even as a child. “I wasn’t picked last for the teams, but I was picked second to last,” she said. As an adult, she wasn’t particularly active either. That is, until eight years ago when her family began taking walks after dinner as a way to get more exercise. Petersen and her son would walk for 30 minutes while her husband and daughter went farther and faster. The 30-minute walk turned to 45. Then Petersen also started walking during her lunch hour. When she came across an announcement about EverWalk’s first event, she felt ready to try 20 miles a day for a week straight. EverWalk provided her with a training schedule, and Petersen recalls her first long-distance warm-up walk of 18 miles. “The blisters kicked in at about Mile 16,” she said. By the time the actual event took place, she had learned to better care for her feet. Other EverWalk participants weren’t as prepared, but Nyad and Stoll had an EMT delivering first aid as well as a second EMT who biked back and forth along the route to keep an eye on walkers and point the way for the directionally challenged. There was also a bus for those who needed a break. Petersen made it the entire distance. “I learned that just because you think of yourself as a type of person, like nonathletic, doesn’t mean you have to live your whole life that way,” she said. That’s exactly what Nyad and Stoll are hoping for: a nation of people willing to push away from their chairs and take to the sidewalks and park trails. The vision of an endurance event for the everyday American caught the attention of Chris Devona, 57, of Mount Prospect, Illinois. Devona joined EverWalk’s first challenge despite his Stage 4 thyroid cancer. He walked with a brace because of knee replacement surgery, averaging about 3 miles every hour. Crossing the “achieve line” in San Diego was ultra-satisfying. “To complete the whole route makes the average guy feel like he just won the Olympics,” Devona said. It may seem strange that a function as basic as walking can trigger an overwhelming feeling of accomplishment. After all, humans are built to walk long distances. But we just don’t do it anymore. According to the documentary “The Walking Revolution,” Americans stopped walking in the 1950s and 1960s when families began moving to the suburbs and the automobile became the favored mode of transportation. Add the television set. Computers. Social media. Alexa. Now we have a nation of sitters. What was once a normal part of daily living has become an effort Americans need to schedule. By 2020, Nyad and Stoll intend to travel by foot across America. Initially, their plan was to walk coast-to-coast with a million people, sort of like Forrest Gump. But after driving cross-country in an RV, they realized the trek works for one or two people but wouldn’t work well for the masses. The long stretches of remote areas were “not conducive to lots of folks coming out to meet up with us,” Nyad said. So in recent months, Nyad and Stoll’s vision has changed. They continue to hold on to their dream of walking across America in some way – maybe by visiting all 50 states. For some, walking has less to do with the physical and mental challenges and more to do with the spiritual element. Linda Fitts, 66, has walked the Camino del Santiago, a pilgrimage route in Spain, three times. As a physician who worked in internal medicine and hospice care, she was prompted to walk, in part, to recover from career burnout. “I reached a point where I needed rest and reflection,” she said. Fitts, who lives in Southern California, also participated as an epic walker in the trek from Los Angeles to San Diego. For her, moving along a walking path has a calming effect. “I like to use the image of not only am I walking the road ahead of me, the road is walking through me. When I begin to feel that flow, it’s a very cleansing and moving process for me,” Fitts said. The word “walk” means “way of life.” And for many, it really is. Published: June 12, 2017, 6 p.m.